This years course focused on three main topics. At first it was tried to evaluate the Diver Carrying Capacity at the dives sites in front of the Royal Diving Center (RDC) according to an index based key Coral Damage Index (CDI). This index revealed that divers in the first 10m and snorkelers in the first 4m do contribute to a certain degree to the deterioration of that contour reef, thus greatly reducing the yearly allowance of dives per year. The second topic aimed at a continuation of last years survey, where we revisited marked diseased corals sites and tried to document the spread of Coral Diseases by adding new sites for future monitoring. The third focus of our survey involved the application of an abbreviated version of the Revised Rapid Assessment Protocol (RAAP). It confirmed the poor state of health of this reef section as the low coral coverage seem to indicate a fragile balance between calcium-carbonate substrate build-up and destruction. The gulf of Aqaba presents itself as a deep basin, which is limited by the flat shelf in the north and the submarine swell (which drops sharply into the Red Sea to 1423m depth) in the south. As the RDC is located some 10km south of Aqaba and 3km north of the Saudi Border, the gulf there extends already to depths of 500m and is approximately 7km wide. The meteorological data from the middle and south end of the Red Sea reveal a complete periodical and seasonal wind-system change. In winter the north to east wind prevails while a south to west wind dominates over the summer months (Wahbeh and Hulings, 1987). The hydrographic conditions of the gulf are highly dependent on its topographical shape. The only 170m deep swell in the south (Street of Tiran) limits the water exchange between the gulf and the main basin of the Red Sea. Thus, the gulf can be considered an autonomous pool of water with its own specific pattern; i.e. lack of thermoclines, high evaporation, high salinity and a persistent current system. The surface water temperature in winter is 21-24�C (November to April), well above the shallow area of Suez (17-20�C). Up until year 1965 the Jordanian share of the gulf coast was limited to a short stretch of only 11km length. In connection with the development of the port of Aqaba, the border has been pushed some 14km south and now runs 6 km north of Haql in Saudi Arabia. A phosphate-loading facility which belongs to the port of Aqaba is situated close to the Saudi border in near vicinity to the RDC. With few exceptions (the sandy northern beach and an approximately 2km dredged shipping channel), coral reefs can be found everywhere along the coast. In this region fringing reefs on the Jordanian coast can sometimes stretch out as far as 140m into the sea. The Gulf of Aqaba lies adjacent to the southern Wadi el Araba, a vast desert band (limited only by Et Tih in the west and An Nefud in the east). Hot summers, rare clouds (often trapped by the almost 2000m high Sinai mountains) and little rainfall determine the extreme dry climate of this deeply cut rift valley. No records on rainfall in Aqaba were available to us, but the data registered by the Israel Meteorological Service of the nearby Israeli resort town of Eilat reveal an annual precipitation of just 23mm (handbook of the Red Sea Nr. 2034, Friedmann 1968). Average cloud coverage of the gulf is low (about 3/10), with the highest coverage in the winter months. During the rest of the year, cloud coverage hardly exceeds 1/10. Thus, an average of 1 mm rain per day can be expected during the winter. Beside the small amount of fresh water directly reaching the gulf, some water sporadically runs through the Wadis from the mountains into the sea. In times of extremely low tide it can severely affect coral reefs off the coast due to decreased salinity, sediment run-off and eutrophication that trigger algal blooms. Aqaba itself has an old low-salinity aquifer that waters vast date palm plantations. The daily hours of sunshine range from 9.2 and 9.8, while temperature fluctuates between 15.8�C in winter and 32.3�C in summer. The local wind patterns around Aqaba differ markedly from those of the entire Gulf Region. This area is dominated by steady winds of approximately 3.7 m/s blowing from the north or north-west. Records of the Israeli rosort town of Eilat revealed that the months of January, February, June and September show the highest wind speeds. Occasionally, wind from the north turns to the south - the so-called "Aziab". This squally wind can generate heavy seas in the northern gulf with waves up to a few meters high, discharging their energy at the northern beaches. Usually waves generated by prevailing winds do not exceed 0.5m. Consequently, atmospheric pressure extremes of the northern Gulf Region merely fluctuate between 1018mb in January and 1006mb in June. The annual average is 1012mb whereas the daily amplitude hovers around 2-3 mb. The coral reefs of the Gulf of Aqaba are among the most northern ones in the world. Unlike reef ecosystems along the coast of Bahrain or the Maldives Islands, in which 95% of the stony corals died due to bleaching caused by the strong El Nino phenomenon (1997/98), the reef ecosystems south of Aqaba remained mostly unaffected. Nevertheless the coral reefs of the northern section of the Gulf of Aqaba are under intense pressure. Even though domestic and industrial sewage spills, emissions of phosphate dust and oil spill disasters are reduced to a minimum due to enforcement of prevention measures, the major impact on the fringing reefs in this area originate from tourist-related activities (Eppstein 1999). Currently, the south coast of Aqaba is designated as an area in which large scale development is being planned. Fun-parks, extensive accommodation facilities and other infrastructural requirements may soon cover the sandy and rocky desert south of the city. Already at this stage, the Jordan authorities have completed a 4-lane road project that paves the way for the following construction phases (fig. 1.1). It could well be that these projects will undergo major revision as more evidence is emerging that such activities might exert detrimental effects on the reef ecosystem. Fig. 1.1 The section south of Aqaba, depicting the future developments and the sites visited during this year's survey. As the popularity of recreational scuba diving increases, the physical damage to coral reef organisms caused by anchoring, diving, and snorkelling has become a major concern of coral reef management. Research done in other parts of the world not only confirm these observations but also emphasise the aspect that divers stir up substantial amounts of sediments, while snorklers, swimmers and reef walkers stroll through the shallow reef areas and substantially contribute to their overall degradation. Because the Middle East region is not subject to cyclone activity, the Coral Damage Index (CDI) is an alternative option to screen large numbers of diving sites (Riegl and Velimirov, 1991). CDI is an objective tool to obtain data about the extent and severity of physical damage done to corals. It has to be mentioned, though, that tectonic events (earthquakes) may have an impact to the fringing and contour reefs of the Red Sea. The Royal Diving Center (RDC) is a small but dynamic facility that was built to boost scuba diving activities in Jordan. We used the RDC to survey dive-related impacts on a small scale. About 8000 divers visit the RDC annually, with probably 3 to 4 times that many snorklers (A. Qatawneh, RDC managing director; pers. comm.). These figures strongly suggest that coral damage should be monitored. Breakage of corals by humans is one of the most common causes of coral decay especially within the upper 10m depth range of popular reef sites. Branching corals of the genus Acropora, Millepora and Stylophora are the most frequently affected genera. In order to quantify such damages it is necessary to design appropriate monitoring programs that respect both scientific and management guidelines. This includes a practicable method to quickly asses the conditions of the reef ecosystems and the extent of potential environmental threats. According to sites Riegl and Velimirov (1991), one approach to evaluate to bulk impact of recreational activity can be expressed by the Diver Carrying Capacities (DCC). It is defined as the number of divers per site per year and is a measure of the number of divers a reef can tolerate without becoming significantly degraded. It plays an important role in the management of physical damage on a coral reef. Up to now, DCCs have rarely been considered by planners and developers. There is a need to provide background knowledge and understanding about these fragile ecosystems, and to support reef managers with this powerful tool for both sustainable development and management. DCCs can be used to effectively determine the potential impacts of such developments in order to achieve a suitable balance with potential diver-related economic revenues. Furthermore, effective diver education programs and supervision of dive-groups should enable reef-managers to monitor and eventually even increase carrying capacities to meet the growing demand. In addition, mooring buoys provided to dive boat operators should limit anchor-related damage to the underlying corals. Another aspect that can severely degrade a reef ecosystem is related to Coral Diseases (CD). Even though coral mortality in reefs is well known and a quite common event, it is the speed at which it currently takes place that should alert all of us. If the dynamic equilibrium between construction and degradation is slightly upset due to anthropogenically related activities, then the fragile equilibrium can shift to the currently observed speedy degradation. In order to slow down the continuous spread of disease and to attempt to conserve corals for future generations, CD monitoring has become even more important today than it was in the past. CD and subsequent biological degradation are caused by predation by polychaetes, crustaceans, mollusks, echinoderms, fish, etc. or simply by the rapid overgrowth with algae, sponges, zoanthids, octocorals, ascidians as well as other scleractinian competitors. Although bioerosion seem to be related to natural causes, it is often also induced by man. To detect gradual changes over time, bioindicators may provide an effective tool to monitor long-term changes that otherwise take place undetected. Unfortunately, the development and use of such reef bioindicators lag far behind those in other ecological disciplines. Finally, we attempted to apply the Revised Rapid Assessment Program (RRAP, Ginsburg 2000) to a short stretch of the reef off the RDC. The RRAP provides accurate data regarding coral species richness, bioerosive activity by echinoderms, and the epifaunal presence of marine algae. As it requires a profound knowledge about coral taxonomy, the RRAP is a very complex and time-consuming procedure. Because the right hand (northern) side of the RDC-jetty is frequently visited by snorkelers and divers alike, it was the aim of this year�s survey to screen that section of fringing reef. There, a total of eleven 10 m transects were placed haphazardly along the reef slope and parallel to the shoreline (six at a depth 4 m and five at depth of 8 m). A 3mm thick synthetic cord was used to outline the transect, whereas beginning and end points were marked with lead weights. Biogenic material directly underneath the cord was classified according to the following five categories; to speed up the census a special U/W sign-language was used. Fig 2.1 Underwater sign language used for a rapid CDI procedure. All transects were measured at intervals of 5 cm and the categories were expressed as percent coverage in reference to every 10 m transect. CDI in the broken and damaged category are based on the overall coral coverage of each transect (excluding the sandy substrate). As soft corals were not censused in our survey, we classed them as inaccessible substrate (with regard to potential hard substrate for coral settlement) and grouped them into the substrate category. Percent of Broken Coral Colonies (BCC) greater than or equal to 4%: The 4% value falls within the range of broken colony data obtained from several other sites. Control sites of completely inaccessed reefs reveal an average of 3% of BCC (Riegl and Velimorov, 1991). Using a margin of error of 1%, a 4% threshold was deemed to be adequate. Percent of Coral Rubble (CR) greater than or equal to 3%: Based on the data gathered by Riegl and Velimorov (1991), this level seems to match the data of pristine control sites. Likewise as in the previous classification, a 1% margin of error was added to obtain a representative reference value of 4%. In our survey, the least affected site, which has been visually determined (was relatively untouched by divers during the two week course) was then used to obtain reference data (transect #5 at 4m depth and transect #1 at 8m depth). Fortunately, divers accessing the reef off the RDC use the 35m jetty; therefore, boat traffic and anchoring were not recorded at all (boat traffic in the area was negligible). In-Situ Identification of coral species: It should be the aim of any naturalist and scientist to encourage in situ identification of corals wherever possible. This had been an impossible task before the advent of SCUBA diving and underwater photography, and even with these aids several problems remain. The major one is that corals are still classified principally based on skeletal features. Some of these are obscured by living tissues and others are so small as to be difficult to distinguish underwater. This difficulty can either be overcome by carrying a magnifying lens or by removing a small portion of the colony for examination on land. This should be done with great care in order to minimize damage, and never in protected areas where collecting restrictions apply. Many genera are distinct and can be readily recognized from good photographs. Others are more edifficult, and thus it is advisable to combine photographs with detailed notes. As corals are extremely "plastic" organisms - even a single species is capable of showing great morphological variations - it takes several minutes to complete this exercise, and as time under water is limited, it is essential to be suitably prepared before entering the water. During all dives, efforts were undertaken to register corals affected by tissue bleaching, white band or black band diseases. Any such colonies that were encountered were marked with buoys to be examined more accurately during follow-up dives in which underwater photographs were taken. Some dives specifically targeted those coral sites that have been documented in the previous field course of 1999. As it proved to be difficult to relocate sites monitored in 1999, we agreed it would be helpful to generate a more accurate map that not only lists major diseases affecting particular colonies but also depicts geographical data regarding depth, inter-coral distances, and angular orientation with regard to fixed reference points (both above and under water). With the help of a 30 m measurement tape, a compass and a depth gauge, we were able to generate a map that should greatly simplify finding those sites in future field courses. The RRAP was chosen in order to work with a protocol that is used by scientists and mangers aiming to determine the regional condition of reefs. As this approach examines the condition of reef-building corals, algae and fishes, we were forced to restrict our observations to the selected parameters (coral diversity, algal coverage, and Diadema sea-urchin count) in order to accommodate our limited time budget. i) all other corals that were already covered by a layer of algae, fine mud, or colonized by both epizoic organisms or endolithic infauna were grouped as "long dead". During the RRAP, our working group was split up into two subgroups; one was charged with determining the overall micro-algal as well as encrusting algae coverage and conducting the sea-urchin count, while the other group was involved in the correct classification of the coral colonies under the transect line. Algal abundance was recorded at 2 m intervals (i.e. at 1, 3, 5, 7, and 9 m) on both sides of the transect line using a grid measuring 20 cm per side. Both the percentage of algal coverage and the approximate height of algae each quadrate were recorded. A Diadema sea-urchin count - including individuals in crevices - was performed within a meter wide band (0.5m on each side) of the transect line. For practical reasons, we divided the transect into several sections in order to facilitate coral identification. Each section - visually separated by sandy patches (see gap in figure 2.2) - was then analysed individually. This approach ensured that in-situ identification could be matched with the photographic documentation done at the end of the census. In addition, the dimension of each colony (width and height) was also recorded. Fig. 2.2 Photo Nr.6 (of 23)1 displaying a short section of the RRAP-transect. Centered section shows Gap "D" (all other photos are listed under this web-address. The transects showed high variation in their composition. The transects at 8m water depth compared with those at 4m, possessed a higher amount of sandy parts. They ranged from 24 % to 59 % at 8m and from 3 % to 15 % at 4m. The average at 8m was 42.6 %, whereas it is a small 8.5 % at 4m, corresponding to 4.26m respectively 0.85m sand for the considered 10m transects. At 8m 40 % of the inspected stretches featured a share of sand of almost 60 % (58 % + 59 %), whereas at 4m 40 % showed only 15 % (15 % + 15 %). Fig. 3.1. Distinguished categories of coral health, substrate type and their recorded frequencies at 4m depth, north of the jetty. Fig. 3.2 Distinguished categories of coral health, substrate type and their recorded frequencies at 8m depth, north of the jetty. The category "sand" was the only one with a higher standard deviation (16.59) at 8m and therefore a higher variability than at 4m (5.28). All other categories were more inhomogeneous at the 4m level. The average share of 45.8 % dead corals at 4m is clearly higher than the 28.8 % share at 8m. The local differences in the abundance of dead corals (including corals that died a long time ago) is clearly high, as reflected in a standard deviation of 12.34 at 4m and 10.98 at 8m. Healthy coral growth on the other hand is substantially more irregular at 4m depth, but with an average of 25,3 % compared to 15,4% at 8m more abundant (standard deviation 11.79 at 4m respectively 6.35 at 8m). Note that the reef shape changes according to depth and therefore relativizes the depicted results. At 4m depth we found corals covering more or less the entire steep-plunging slope. In the surveyed area the angle of the reef slope flattened at about 6m depth. From there and deeper the reef shows patchy patterns of coral aggregations and single corals altering with bigger and smaller expanses of sand. The species composition also changes with depth. The fragile Millepora dichotoma (Hydrozoa), one of the dominant, dense-growing and often damaged species at 4m, was lacking at 8m. The coral rubble at 4m average 12.5 %, thus being higher than 7.8 % at 8m. The rubble indices at 4 m range from 4 % to 24 %, whereas at the 8m level they range from 4 to 11 %. In any case the measured values were significantly higher than those gained from pristine reefs (Riegl and Velimirov, 1991). The coral rubble distribution at 8m was the most even of all categories, having a standard deviation of only 3.11. Broken corals were more abundant in 4m, with an average of 7,8 % opposite to 5,4 % at 8m. The range was 2% to 23 % at 4m and 0 to 12 % at 8m. Related to the healthy coral coverage, even at 8m, the values were quite high. As for coral rubble, the results for broken corals are well above those from healthy reefs (Riegl and Velimirov, 1991) (see Fig. 3.3 + 3.4). The standard deviation is 8.08 for 4m and 4.77 for 8m. Fig.3.3 Relative coral abundance of broken coral and coral rubble at 4m. Fig.3.4 Relative coral abundance of broken coral and coral rubble at 8m. The map depicts the area of the performed diving activities (for the coral disease survey only). It comprises all locations of denoted, investigated diseased corals. Tab. 3.1 Cross-reference of the investigated sites ("used buoys"; refer to the markers used during the survey, whereas "permanent buoys"; were placed for future surveys). Fig 3.5 MAP portraying the research area of the coral disease survey. 32 1, 2 K9 Astreopora sp. F1 3 3 Favia sp. A-alpha 4, 5 buoy A alphaK9 Astreopora sp. MY2 6 buoy MY2 Goniopora sp. TC 7, 8, 9 no marker large Acropora sp. 36 10 K1 Coscinaraea sp. P8 11, 13 next 2 Coscinaraea sp. new BBD 16 K2 Coscinaraea sp. P1b 21 K7 Plesiatrea sp. or Echinopora sp. Astrep 28, 29 K6 Astreopora sp. MY1 - K8 Astreopora sp. The listed corals belong to the following families Acroporidae, Poritidae, Siderastreidae and Faviidae. Branching corals seem to be less affected by diseases. Due to a tight time budget only one transect was performed. Within the 10 m transect surveyed we encountered various types of coral species (scleractinians), stemming from eleven families, namely: Mussidae, Siderastreidae, Faviidae, Poritidae, Acroporidae, Pocilloporidae, Dendrophylliidae, Fungiidae, Agariciidae, Themnasteriidae and Pectinidae, further soft corals (Sarcophyton sp. and Xenia sp. The taxonomic determination yielded a detailed list (tab. 3.2), while the photographic documentation provided a series of 26 images. A total of 23 photos were taken, of which one is shown in figure 2.2.see figure - Material and Methods). Photo-#, Reference code listing the species for easy retrieval on the photograph; photos are accessible at this web site. The estimation of algal coverage in percent. The sampling frames measuring 20x20cm were placed along the transect line in 2m intervals. 15 individual sea-urchins (Diadema sp.) were found along this 10m stretch. Tab. 3.3 Percentage data of the algal coverage along this transect. In the marine environment, most potential threats (biological and physical) broadly decrease with increasing depth. Apart from natural disturbances (earthquakes, cyclones, bioerosion, etc), manmade disturbances may range from extensive exploitation of carbonate reef rock by local inhabitants to intensified ENSO-effects (El-Nino-Southern Oscillation) due to globally changed climate patterns. In this year's field excursion we focused mainly on the issue of diver- and snorkeler-related impacts that derive from the booming tourist industry. Corals under stress: Most coral diseases are stress related. Stress is considered to be a significant deviation from conditions optimal for life; it elicits changes and responses at all functional levels of an organism, and these changes may be reversible. If stress is very intense or persists for a longer period of time, however, these changes can be permanent, thus reducing the overall resistance, and can ultimately kill the organism (Fig.4.1). The dynamic response of the whole organism to external influences can lead to distress, comprising a destabilizing effect upon the organism, or eustress, promoting a stabilizing and resisting effect (Larcher 1995). Thus, corals can take decades to repopulate after devastating events, but such events plane the path for rarer, slow-growing species to repopulate the area. Fig.4.1. Phase model of stress events and responses of corals (Larcher 1995). Unfortunately, the current state of many coral reefs seems to have passed the resistance phase and is apparently entering the final phase of exhaustion. Stress that increases a coral�s susceptibility to diseases can have natural causes (e.g. inter-/intraspecific competition, predation etc.) but can also be anthropogenically induced. Other damaging impacts include construction activities and the operation and maintenance of these completed facilities (especially freshwater run-off and wastewater management - that nowadays can be partially controlled by introducing renewable energies to maintain sustainable development). The objective of this year's field course, however, was to extensively investigate the direct damages exerted by watersport activities. As the coast south of Aqaba is designated for major touristic development it is crucial to focus on the potential effects on the reef ecosystem caused by unregulated access to the visiting public. Fig 4.2 Photos of injured snorkeler after being washed against the reef crest by a wave. Already today, the growing number of snorkelers and divers cause increased damage to coral reefs worldwide. Figure 4.2 shows a snorkeler that was drifted onto the reef (in Nov. 2000). The harm caused by SCUBA diving and snorkelers depends not only on the skills and training of the individual but also upon the dive operators who provide access to a particular reef site. Especially at heavily frequented spots, divers stir up sediments, break corals, and their scuba bubbles damage sensitive overhanging soft corals, while their urine poses an additional stress factor to the fragile ecosystem (Green, 1997). However, unless one actually observes the damage taking place, it is difficult to know for certain the cause of a physically damaged coral. In very shallow areas, where fragile branching corals are abundant, damage by snorkelers can determine whether an underwater "trail" should be closed and snorkelers moved to another location to allow the initial site to recover. Ideally, underwater trails should be placed in areas deep enough to reduce damage from fins, but the best protection comes from educating snorkelers and divers alike. CDI: The CDI (Coral Damage Index) was used to screen the reef site off the shore of the RDC to obtain a perspective on the extent and severity of physical damages caused to the corals. According to Jameson et al. (1999), sites are listed as "hot spots"; if in any transect the percentage of broken coral colonies is greater than or equal to 4% or if the percentage of coral rubble is greater than or equal to 3%. DCC (Diver Carrying Capacities) are rarely considered "up-front"; by planners and developers. As a result, coral reef managers in many areas have to fight uphill battles to convince authorities to limit sport diving and snorkeling volumes. In areas such as the coast south of Aqaba, where new development is being planned, DCC can be used to effectively design the size and configuration of the tourist development so it is in balance with potential diver-related economic revenues. DCC is usually expressed as the number of dives per site per year. It is a measure of the number of divers a reef can tolerate without becoming significantly degraded, and also plays an important role in the management of physical damage on a coral reef. Jameson et al. (1999) estimated that the DCC threshold for an average dive site is between 4000 to 6000 dives per year. At many sites though, DCC can be considerably lower - i.e. supporting levels of only 500 dives per year. These figures must be seen in light of the approximated 8000 dives per year that are currently registered here (personal communication Ahmad Qatawneh, manager of the RDC). A certain percentage of the divers here and elsewhere will always be beginners or poorly trained. Thus, during the survey we often observed divers that were not properly buoyant or overloaded with lead, thus, crashing into the hard substrate, breaking corals or dipping into the soft sandy bottom and stirring up masses of sediments. As the northern reef section off the RDC is already heavily influenced by sedimentation (refer to figures 3.1 and 3.2), we estimate that the larger range of 4000 to 6000 dives per year may even exceed the maximum dive capacity. To obtain an accurate DCC threshold level, further and more detailed examination would be required using a suitable control site that features similar abiotic stress factors with no disturbances of the diving and snorkeling community. Such a site was not available within the close vicinity of the RDC, and our results are therefore only tentative. Damage was most frequent within the first 10 m depth. There, a substantial amount of corals were overgrown by algae. In most cases corals of the genus Acropora, Stylophora and Pocillopora were most frequently affected, while corals of the genus Millepora were predominantly affected within the first 5 m. Apart from the boom and crash population of "r-strategists" (e.g. Stylophora pistillata), it seemed obvious that divers and snorkelers accelerate the quick decay of these organisms as they exert extra stress upon the reef ecosystem at the RDC. In order to match the growing demand for the recreational community, effective diver and snorkeler education programs enable coral reef managers to maintain high numbers in DCCs. Coral breakage at popular reef sites has been investigated by several scientists. Riegl and Velimirov (1991) recorded breakages at reef sites at the Israeli resort town of Eliat (opposite Aqaba) before closure to the public. They documented a general trend of 5.2 % broken coral colonies (from shallow to deep), half of which were located in the upper 2 m depth range. Our observations off the shore of the RDC revealed a similar picture in most of the transects analyzed. The percentages of broken coral at the 4m depth range seemed more extensive than damages observed at the 8m depth range. In transect #3 (4m), broken coral percentages peaked at 23 % while other transects at the same depth ranged from 2 to 11 %. The data of the 8m depth range were considerably lower, although transect #3 and 4 exceeded percentage levels of those at 4m depth (figure 3.1). In these cases the steep slope of the reef crest suggests that coral debris originated from the more shallow areas. The data of coral rubble further emphasized this trend. The indices at the 4m transects ranged from 4 to 24 %. Likewise at a depth of 8m, the data still revealed percentage levels between 4 and 11%. In reference to Jameson et al. (1999), these data suggest that the reef-site of the RDC suffers under the sheer bulk of the diving and snorkeling public. Note, however, that overall damage need not necessarily be related to divers and snorkelers alone. Nonetheless, it is recommended that authorities should limit access to particular dive spots that are essential for the survival of the reefs of Aqaba. One strategy is to keep the bulk of visitors concentrated at certain locations (e.g. Cedar Pride Wreck or other sites that remain to be determined) while limiting the more pristine areas (e.g. Gorgonia I & II, and Saudi Border Drop Off) to the more experienced divers. Other strategies include the installation of fixed buoys and training platforms under the surface to limit damage, as well as test-dive qualification procedures that may entitle the trained diver (snorkeler) to visit the more pristine and fragile areas. Furthermore, we suggest that an in-depth introductory course about reef ecology should be provided to inform visitors not only about the reef's fragility but also about local regulations. In summary, we recommend channeling the thousands of dives per year in such a way to minimize reef damage at the RDC. To increase awareness, it should be in the interest of divers and dive operators alike to introduce special training sessions for the inexperienced visitors, to close certain areas and declare them as no-diving zones. Finally, the activity of local fishermen probably contributes to the overall negative impact on the reef. At various reef sites we visited, numerous traces and remnants of fishing activity were found. Simple stone anchors are apparently dropped randomly onto densely covered reef sites (Gorgonia I + II, and Saudi Border Drop-Off - see fig. 4.3) often damaging the corals beneath. Abundant fishing nets are entangled in and suffocate the live coral tissue. In consequence, the affected coral parts enables algal turfs to settle, which in turn block off essential sunlight further promoting the colonies decay (e.g. attract larger numbers of bioeroding echinoderms). Fig 4.3 Damage caused by fishing practices. Coral Diseases (CD): As mentioned previously, corals can die as a result of both natural causes and human activities. If these corals are not replaced through the process of reproduction and recruitment, the reef will eventually degenerate. Corals provide a primary link in the food chain as the sites of photosynthetic fixation of light energy through their zooxanthellae. They also provide a habitat for numerous associated fish and invertebrates. If the coral populations on the reef decline, so will the rest of the community. Whether a reef is killed quickly by a catastrophe or slowly by attrition (no population replenishment), the result is the same: the loss of the reef and all it has to offer. Kinne (1990) stated that diseases affect basic phenomena of life in the oceans and coastal waters: for example, life span, life cycle, abundance, distribution, metabolic performance, nutritional requirements, growth, reproduction, competition, evolution, as well as organismic tolerances to natural and manmade environmental stress. In short, diseases are a major denominator of population dynamics (see also fig. 4.1). The first reports of a disease affecting scleractinian corals appeared in the mid 1970�s and was termed Black Band Disease (BBD). It was first reported from reefs off Belize and Bermuda, but has since been found throughout the Caribbean as well as the Indo-Pacific (Antonius, 1985). In the waters off the RDC, massive corals of the family Faviidae were the most commonly affected representatives, while staghorn corals were unaffected. This finding is enhanced by Peret's observation (1997) that staghorn and pillar corals resist natural infection. BBD results from the invasion of coral tissue by the photosynthesizing cyanobacterium Phormidium corallyticum (= Oscillatoria submembranacea). The disease line appears as a black mat a few millimeters wide composed of fine cyanobacterial filaments that also contains sulfate-reducing bacteria,sulfide-oxidizing bacteria, and sometimes fungi and protozoans. These microorganisms produce anoxia deep in the band next to the tissue and hydrogen sulfide, which kills the coral tissue and allows the microorganisms to use the organic compounds released by the dying coral cells for their own metabolism (Cartlon and Richardson, 1995). If enough light is available to form a tiny algal spot, it gradually turns into a dark ring of tissue-stripped coral skeleton that proceeds onwards by a few centimeters per week, enlarging the denuded area. Small corals are entirely deprived of their living tissue, while larger ones may resist as the band migrates into less illuminated areas (see figure 3.8, site F2, Plesiastrea sp). In many cases the coral can fight BBD by producing an excess of mucus, thus starving the bacterium. Being contagious, BBD can spread easily to other corals by means of wave action. The distribution of infected corals off the RDC was clustered in close proximity to one another, suggesting that the disease is highly infectious between colonies, and might have resulted from accidental encounters of drifting filaments of Phormidium corallyticum of neighboring colonies (see map in figure 3.5 - starting from the 8.5m deep buoy beyond F2 and nBBD). As observed with several colonies (e.g. Coscinaraea sp. sites P10 and F2 of the 1999 survey), the colony did survive BBD, although the coral was greatly reduced in size and vitality. This interpretation is further emphasized by the fact that the band disease in these corals did not progress through the entire year but rather occurred in episodes (Peter, 1997). It seems that the only increase in infection rates and loss of tissue occurred during late-summer when seawater temperature was at its peak. In addition, a lot more colonies affected with BBD were found in this year's survey than a year ago. Thus, diseases like BBD may prove even more damaging in altering growth and development of the massive reef-framework-building corals on reefs chronically exposed to higher seawater temperatures and anthropogenic stresses. The of BBD observed off the coast of southern Jordan may reflect adverse environmental changes and human interactions. In contrast to BBD, however, some infested species (see figure 3.12, the large table coral Acropora sp.) did not show a consistent assemblage of microorganisms at the junction separating the sloughing tissue from bare coral skeleton. It was obvious that in these cases we were dealing with white band disease (WBD, also been referred as �white plague� and �white death�). The etiology of WBD is unknown. Unusual aggregations of GramNEG rod-shaped bacteria were found scattered in the calcioblastic epidermis (skeleton-producing tissue) that lined the gastrovascular canals of the porous skeleton. WBD usually starts at the base of the branches and moves up toward the apical end of the branch tips at the rate of a few millimeters per day (Birkeland, 1997). As coral tissue dies and is sloughed off the skeleton, endolithic boring sponges, algae, and other organisms quickly invade the calcium-carbonate substratum, breaking it down and destroying the coral. 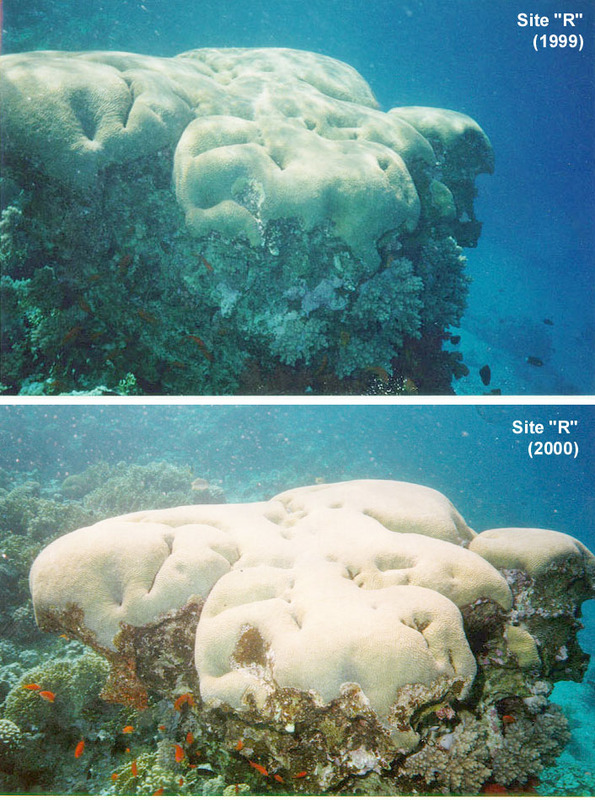 Thus, large scale WBD-outbreaks may alter the reef topography, eventually causing the collapse of the reef itself. Extensive loss of topographic relief affects fish populations as protective niches and important habitats are altered. The decline of coral-reef fisheries with the concomitant effect of overfishing probably contributes to further losses in fish species diversity (Rogers, 1985). In this years field course we revisited the large Platygyra coral at 2m depth (refer to site R - "references on the WWW", under "coral disease links") and observed that the coral head was not only affected by the bioerosive activity of the endolithic sponge Cliona sp. and the boring Diadema sp. but also by the reoccurrence of WBD at the edges of the colony. During this years survey, we noted that an almost 50% of dead coral coverage among the 4m deep transects (refer to figure 3.1). This result may well be an indicator that unfavorable surface water currents regularly inundate the first few meters. The loss of zooxanthellae and/or to the loss of photosynthetic pigments from the zooxanthellae, which normally give the coral tissue a brownish coloration, may have triggered a massive die off at this depth range. One explanation can be found in the occurrence of a lesser dense surface layer (than the remaining water body) during the hot summer months. It seems that unfavorable conditions may have persisted for more than just a few days, thus killing sensitive corals and paving the way for bioeroding organisms. Again, the r-strategists (like Stylophora, Acropora, and Pocillopora - refer to figure 3.5, and Pocillopora sp. next to F6) were the species most affected by TBL. This phenomenon is generally referred to as coral bleaching or tissue bleaching (TBL). Bleached corals, gorgonaceans, alcyonaceans, scleractinians, and anemones have been attributed to the exposure to high light levels, increased solar UV radiation, high turbidity (sedimentation resulting in reduced light levels), temperature and salinity extremes, and other factors. The nature and extent of bleaching vary between individuals and among species at the same location during a bleaching event and have been attributed to different physiological tolerances of the species of zooxanthellae and the coral hosts. Chronic partial or widespread loss of zooxanthellae, for whatever reason, signals a disturbance in the normal metabolism of the coral host and can lead to delayed or reduced reproduction, tissue degradation, reduced growth, and death of the affected tissue (Williams and Binkley-Williams, 1990). A year round observation, or at least water temperature and atmospheric monitoring in spring and all through the summer would provide enough evidence to strengthen this hypothesis. 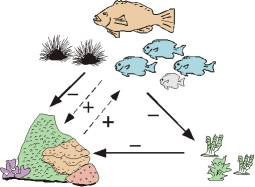 Revised Rapid Assessment Program (RRAP): The vitality of a reef (apart from bioeroding invertebrates) depends on complex relationships among corals, fishes and algae (fig. 4.4). When changes occur in the community dynamics of one of these components (e.g., algal abundance), the other two components are affected as well and the whole relationship can be disrupted. Therefore, to evaluate the condition of a reef from a one-time assessment, it is critical that multiple indicators of the corals-algae-fishes relationships are examined. RRAP is one of few programs that have been developed to generate an extensive regional database on Caribbean coral reef condition. Apart from the CDI-program, our working group attempted to apply the RRAP in order to assess damage that go beyond the impact of diver and snorkeler related effects. The application of this program turned out to be a major challenge to all participants, as essential knowledge regarding coral taxonomy, invertebrate recognition, and fish identification was extensively applied during this attempt. Due to time restrictions, only few working hours were available for this particular investigation. Nonetheless, we carried out this program at least to the stage of coral identification, bioerosive impact by the sea urchin Diadema sp., and determination of algal coverage on denuded coral CaCO3-skeleton on one particular 10m long transect at an average depth of 15m. Fig.4.4 Reef interdependence (adapted from Ginsburg - originally Jackson,1994). The herbivores (Pomacentridae, Signaidae, Acanthuroidae, Echinoidae and Scaridae) serve several functions. They result in a higher, overall ecosystem primary-productivity, they facilitate the flow of energy to higher levels in the trophic web, and if intense, they lead to the predominance of sessile organisms, particularly those with calcareous skeletons (Wood, 1999). Sea urchins (Echinoidea) are the only echinoderms capable of significant bioerosion. Sea urchins possess a highly evolved jaw apparatus (Aristotele's lantern), a flexible and protrusible mastigatory organ. Sea urchin spines also assist in bioerosion when they are employed to enlarge burrows. Sea urchins graze on algae growing on dead coral substrate. In some areas they also attack live coral, but usually they remain in their burrows and feed predominantly on drift algae. Sea urchins can cause substantial erosion at low and moderate population densities; at high densities, their destructive role rivals that of clionid sponge erosion and can lead to rapid framework loss (Birkeland,1997). Our observations during the RRAP revealed a substantial loss of live coral tissue on most of the corals screened along this particular transect line. None of the coral colonies encountered in that transect exceeded 0.07m2, with most of them covered by one or more algal tufts. Larger colonies (except the large Coscinaraea colony, photo-# 4-6 - see "references on the WWW" under "coral disease links") showed some signs of distress with one or more dead spots. Furthermore, the 15 Diadema sp. individuals counted along the 10m transect line are far below the holding capacity of 20 individuals/m2 (Birkeland, 1997).# Nonetheless. they still act as a degenerative force because we consider the reef to be severely affected by both abiotic and biotic influences. This fact is further emphasized by the presence of filamentous microalgal coverage, which in certain sections of the transect peaked at 40%. Due to the time restrictions mentioned above, we were unable to gather further data to fully evaluate that stretch of coral reef. Because of the complexity of the RRAP, and the time-consuming procedure of this survey, we suggest that future screening procedures along the reefs of southern Jordan should mainly focus on this approach alone. As taxonomic identification poses a too complex task for untrained working groups, we briefly would like to put forward a theoretical "ataxonomic approach" that might facilitate a rapid state of health determination of Aqabas reef sites. An ecosystem is more than just the sum of its populations (see fig. 4.4). It should be rather seen as a complex network of energetic flux that is circulated and recycled. It is directed from the autotrophic via the heterotrophic towards the top predator level that has its connectivity in the food-web, the competition between species, the systemic homeostasis of resistance, and the stability of population dynamics. Thus an ecosystem can be considered a "supra-organism" in which succession determines the dominance of a particular population at a given time. In the highly competitive environment of a coral reef, niche specialization is one of many options to avoid large-scale competition with other species. But not all organisms that predominantly feed on one particular resource, e.g. carnivores, are strict in their diets. Most often, when the prime food source has become scarce, these species can feed on a wider variety of potential resources. In many cases, most carnivores are then predominantly herbivores (Wood, 1999). Such dietary shifts most often take place when an ecosystem is pushed out of balance. Elimination of a secondary or tertiary trophic predator - be it due to natural or man-made influences - need not necessarily lead to ecosystem collapse. It may rather undergo drastic changes regarding the balance between producers and consumers (see fig. 4.5). Most top predators are considered to be "persisters" (k-strategists) because they have the ability of staying close to their carrying capacity. Their general traits are large size, delayed reproduction, iteroparity, a small reproductive allocation, much parental care, and the production of few but large offspring. "Colonizers" (r-strategists) on the other hand have an ability to multiply rapidly in numbers. Their traits are small size, precocious reproduction, semelparity, a large productive allocation and the production of many but small offspring; e.g. cyanobacteria. It is therefore understandable that eutrophication largely favors the r-strategists and that the introduction of insecticides via freshwater run-off has a detrimental effect on the k-strategists. Accordingly, ecosystem stability does not exist as such, but rather is a constantly tuned system that dynamically adapts to variability, recovery, migrative patterns, loss of species, and distinct characteristics in time. In order to determine the integrity of an ecosystem, a long-term monitoring program on species composition can provide an answer. 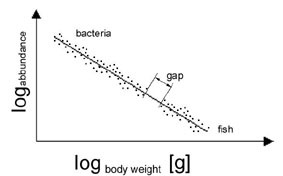 Generally, the net standing biomass (stock) - of bacteria matches that of the top predator such as fish (excluding metabolic loss that may account almost 90%). In cases where an ecosystem is intact, the plot of log-body mass versus log-abundance yields a more or less linear and continuous pattern (fig 4.6). 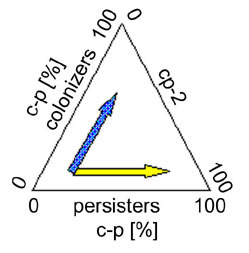 Fig.4.5 Disturbance and recovery within the reef ecosystem; c, colonizers, p, persisters (adapted from Steinberg, 1999) 2. Fig.4.6 Ataxonomic approach (adapted from Steinberg, 1999)2. Bacteria are the most abundant but also the least heavy, while the fish are the most heavy and the least abundant. In ecosystems that are shifted out of balance, larger gaps (as seen in figure 4.6) indicate a disrupted population composition. Such patterns are usually characterized by the absence of certain "size class"- predators. This absence can either be the result of incomplete data material, insufficient sampling methods, or simply the consequence of a perturbed ecosystem. Thus, the ataxonomic approach enables a quick and efficient check of a reef-ecosystem. By pin-pointing the absent size-class(es), this approach enables the identification of key-species and their use as indicator organisms. The only question that cannot be answered under these circumstances regards the dimensions of the disrupted pattern (within the logarithmic plot). For example, what is the threshold size of a gap in order to assign an ecosystem stressed or even disrupted properties? We assume that this question can only be answered when confronting the gap size data with the species abundance data of the reef ecosystem. Conclusion: Although coral reefs are among the most productive ecosystems in the sea, reefs are among the most vulnerable to overexploitation. This years survey revealed that the dive sites off the RDC are under stress by both the diving community, the snorkeling public, the fisheries, and presumably several abiotic factors exert a too heavy extra burden onto the coral population. In all aspects, from the coral damage index, via the diver carrying capacity, to the coral diseases, we found enough evidence that this stretch of reef is no longer in balance in regards to the construction and the (bioerosive) destruction of calcium-carbonate matter. Despite having the power to create the most massive structures in the world made by living creatures, the thin film of living tissue of corals seems particularly vulnerable to natural disturbances and the effects of human activities. Coral reefs may need thousands of years to fully recover from changes brought about by human activities during the 20th/21st century. As for the reefs of Aqaba, the public, the scientific community, and all other interest groups are called upon to become involved determining how to best exploit the reef but also to ensure the viability and longevity of the Northern Red Sea's most precious natural resource. Acknowledgements: We would like to express special thanks to Dr. K. Kleeman for helping us to correctly identify coral species. Epstein N., Bak R.P.M., Rinkevich B. 1999; Implementation of small-scale "no-use zone"
Riegl B., Velimirov B., 1994; The structure of coral communities at Hurghada in the Red Sea.